The 2015 Try Tag Rugby Corporate Challenge will be taking place on Friday evening, 7th August at East London RFC’s first class facilities which are just a five minute walk from West Ham station. The venue is only a short commute from Canary Wharf and the City via the Jubilee, Hammersmith & City, District and National Rail lines, making it easily accessible for work teams. An afternoon of Tag Rugby action, opportunities for team building and networking whilst raising money for charity; what’s not to like about the 2015 Corporate Challenge? If your work mates have never played Tag Rugby before, don’t worry. This tournament caters for new and existing corporate teams as there will be Cup, Plate and Bowl titles up for grabs which will allow your team to play at your correct level. In previous years, the Corporate Challenge was a mammoth success, attracting high profile companies such as Google, Yahoo!, Pcubed and Stephenson Harwood to name a few. Get your workmates involved in 2015. 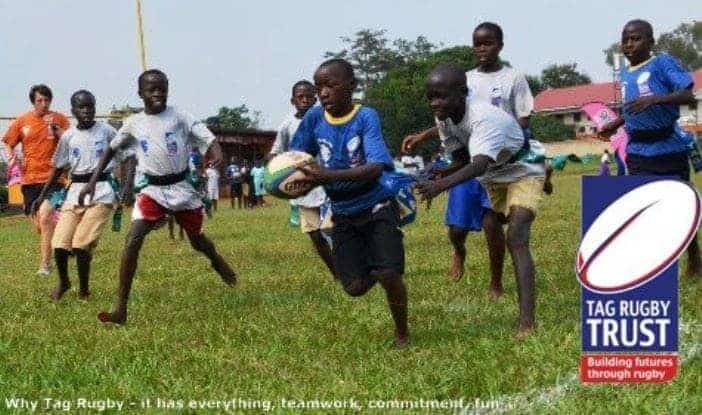 Try Tag Rugby’s official 2015 charity partner, the Tag Rugby Trust has grown to work and organise tours in the UK and eight developing countries including Zambia, Uganda and Romania. The Tag Rugby Trust introduces children to Tag Rugby, involving young leaders and teachers to help create a sustainable rugby community. The Tag Rugby Trust’s inspiring work helps develop grass roots Rugby and in turn has a positive impact on many children’s lives that live in lower tier Rugby nations. Try Tag Rugby has always been a strong supporter of charities and in 2014 donated over £3,000 in resource, time and funds to the Nathan Cubitt Trust. Nathan Cubitt broke his neck playing full contact Rugby Union for Keighley U/17s in 2011. The trust was setup to help his family with a measure of financial support with which they can handle the many additional expenses which stem from his condition. In other news, the team at Try Tag Rugby are looking to expand their workforce and are now hiring. If you want to work in the Rugby industry then this is your chance. Try Tag Rugby provides people a chance to play Tag Rugby in a friendly, social, fun and welcoming environment. In these leagues customer service is of the highest priority. Running a successful Tag Rugby league or event is highly enjoyable and rewarding. Ultimately if the players are enjoying their Tag Rugby experience, you will too! Spring is in the air, which means Try Tag Rugby’s Early Summer leagues are now open for registration, with leagues kicking off from 27th April onward. There has been some exciting new venues added to the schedule and new men’s and ladies leagues have been added. New mixed leagues will be running at Finsbury Park on a Monday and Clapham Common on a Thursday. If you would like to get involved in a Try Tag Rugby Early Summer league, you have the option to register a team, part team or as an individual. For all details and how to register, click here. If you’re an Aussie or Kiwi new to the UK, if you get involved you will make a heap of new friends, keep fit and have plenty of fun! We hope to welcome you to a Tag Rugby pitch soon.